Location: Carrying the track going south east from Cil Farm over the canal. The Brecknock and Abergavenny Canal was promoted in 1792 to connect the upper Usk valley to the Monmouthshire Canal at Pontymoile and from there to the sea at Newport. Construction began in 1797, with Thomas Dadford Jnr. as engineer, and the first section, from Gilwern to Llangynidr was completed in that year, with the stretch as far as Brecon following in 1800. Work then stopped for a time with the result that the section to the Blaenavon Road east of Govilon was not completed until 1805, now with Thomas Cartwright as engineer. Further funds had to be raised and the last section from west of Llanfoist to Pontymoile was completed betwen 1809 and 1812, with William Crossley as engineer. Linked to the tramroads the canal was an important artery for trade in iron, lime and coal. In 1865 the Brecknock and Abergavenny Canal Company merged with the Monmouthshire Railway and Canal Company who owned the connecting canal from Pontymoile to Newport. Later still in 1880 the MR&CC was bought out by the Great Western Railway and gradually the canal was run down until it was abandoned finally in 1962. 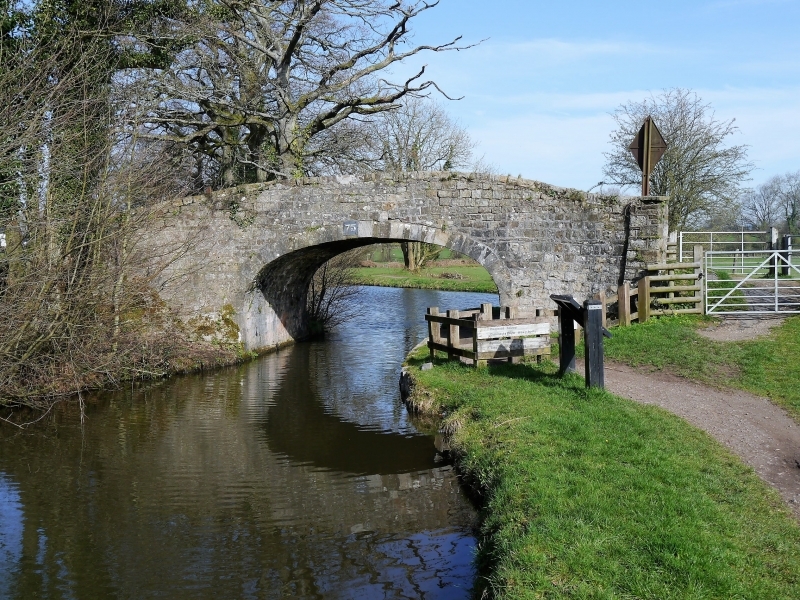 Restoration work was begun in 1964, and the canal is once again open between Pontymoile and Brecon with the title Monmouthshire and Brecon Canal. Accommodation and access bridge over the Monmouthshire and Brecon Canal. Semi-elliptical arch with voussoirs; squared, faced and coursed local sandstone; parapet with slab coping; curving abutments. Bridge number on south face of arch. Towpath runs beneath bridge arch on east side. Included for its special interest as one of the unaltered surviving early C19 Brecknock and Abergavenny canal bridges. About 3000m north of the Church of St. Illtyd approached down a track from the Old Abergavenny Road. Carrying the lane going east from Pencroesoped over the canal. About 150m north of the cross-roads at Pencroesoped in the direction of Llanover village. Carrying the Old Abergavenny Road over the canal. On the north side of the house at Goytre Hall. On the west side of the A4042 about halfway between Penperlleni and Llanover by the junction with the road to Chainbridge.